New Delhi / Islamabad: India will take all steps to combat terrorism emanating from Pakistan, foreign affairs minister Pranab Mukherjee said on Monday, adding the government in Islamabad must also act against terrorists on its territory. Meanwhile, seeking to call Islamabad’s bluff, India has handed over to Pakistan a letter written by the lone surviving terrorist involved in the Mumbai strikes wherein he confirms the nationality of himself and the nine slain attackers as Pakistani. The letter, written by Ajmal Mohd Amir Kasab, was handed over to Pakistan’s acting High Commissioner Afrasiab when he was summoned by joint secretary (Pakistan) in the foreign affairs ministry T.C.A. Raghavan here. “In his letter, addressed to the Pakistan High Commission, Kasab has stated that he and the other terrorists, killed in the attack, were from Pakistan," the foreign affairs ministry said. Kasab has sought a meeting with the Pakistan High Commission officials for legal aid to him. The government in New Delhi has blamed “elements" in Pakistan for being behind the 3 day attacks that began on 26 November on Mumbai that killed 184 people. Pakistan, which has pledged to cooperate with the investigation, said it has been given no evidence the attacks were carried out by Pakistanis. The assault rekindled tensions between the nuclear-armed neighbors, which have fought three wars since independence in 1947, twice over Kashmir. The two sides started peace talks in 2003 after pulling back from the brink of a fourth war in 2002. 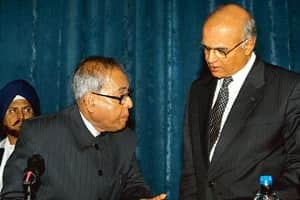 Mukherjee says India has provided evidence of the involvement of terrorists on its territory in the Mumbai attacks “not once, not twice, not thrice but on 10 occasions."